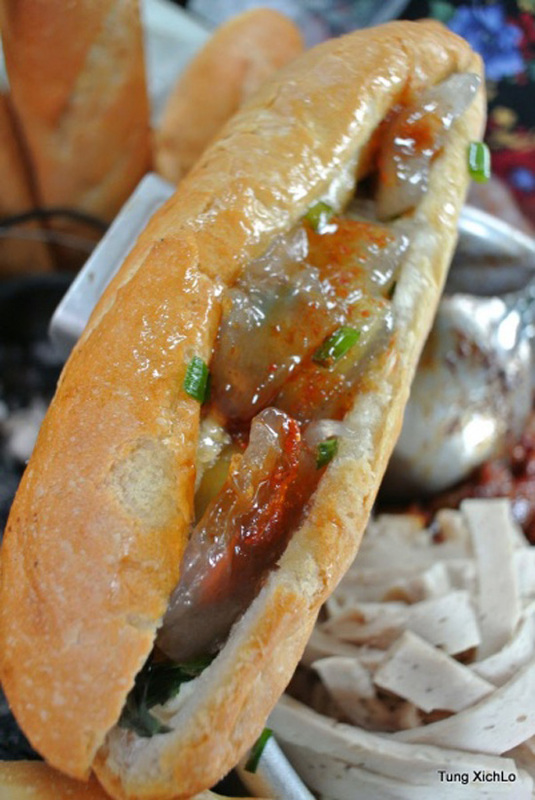 How many types of Banh mi are there in Danang? I have been writing this post for a while now and what better time to publish it after The Guardian declared banh mi the world’s best street food. So here we go.I have mentioned somewhere that Danang-ians are very creative when it comes to food. People invent numerous versions of some cannot-be-cheaper stuff to beautify this life. If you’re a lifetime lover of banh mi, and you live in Danang or about to visit Danang, well good news: you can get yourself some of the cheapest, most delicious and most creative versions of banh mi in the world. Let’s start with the very basic banh mi first. As I have introduced in this post, normal banh mi is filled with pork or char siu, chả, pâté, spring onion, cucumber, cilantro, chilli, Vietnamese mint and possibly some other herbs. This can be found anywhere in Vietnam. If you’re not familiar with the city area, go to 79 Phan Chu Trinh. This shop belongs to a popular banh mi chain in Danang, producing their own banh mi inside the shop and is open from 5am till late in the evening. If you’re more confident getting around Danang and determined to find the tastiest banh mi in town, I’d recommend my personal favourite: the no-name stand at the red star location marked on the map below. It should be a few meters from 491 Hai Phong, at the beginning of an alley. Among heaps of banh mi shops I’ve tried in Danang, the amazing banh mi of this stand clearly stood out for me, and will be mentioned again somewhere in this banh mi series. 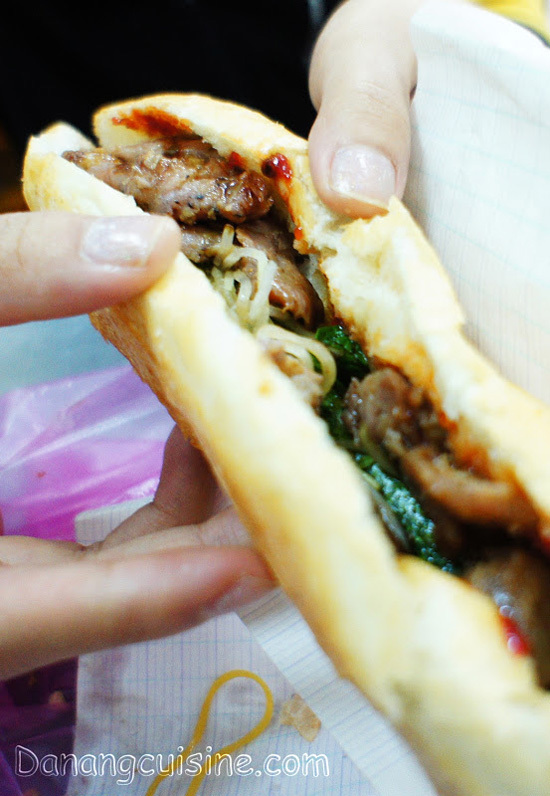 Another typical type of banh mi is bánh mì thịt nguội. The main ingredients are jambon, cha and pate. There are no other herbs but long strips of chilli, cucumber and spring onion. 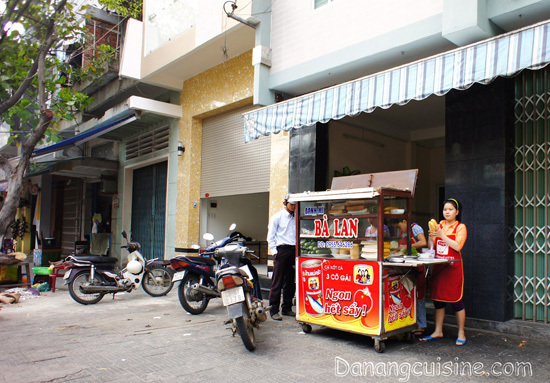 One of the most, if not the most, popular shop selling banh mi thit nguoi in Danang is Ba Lan (62 Trung Nu Vuong). It’s so good and famous that there’re already numerous ‘fake’ banh mi Ba Lans everywhere to derive the brand name. I’m pretty sure that the real shop is at 62 Trung Nu Vuong. Very generous amount of fillings as can be seen from the photo above. 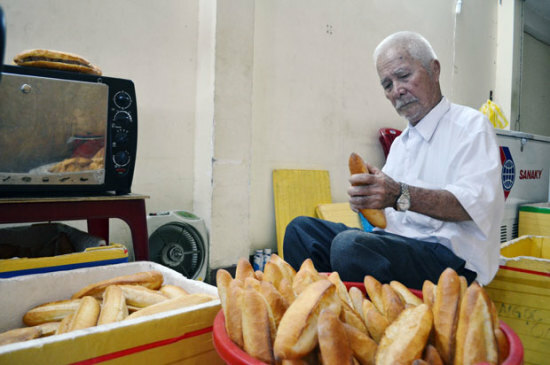 Still in the mainstream is bánh mì thịt nướng. Fillings generally include grilled pork, Vietnamese mint, papaya pickle, a bit of butter, pate and chilli sauce. For this one you should go to the small stand named “Huong” at the intersection of Le Loi and Le Thanh Ton. This stand is quite popular among the younger generations because some of the biggest high schools of Danang are located around that area. 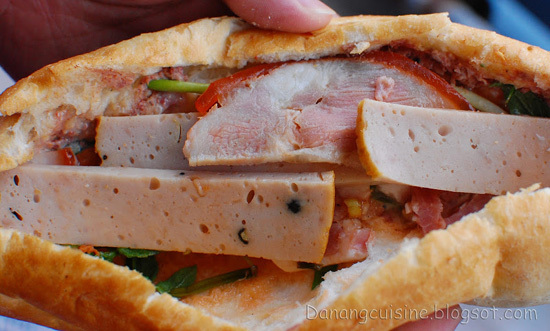 If I have to pick one version to represent banh mi in Da Nang, this must be it. Distinctive, simple, cheap, tasty, widely available locally and can’t be found anywhere else. Unlike normal banh mi, bánh mì gà (literally “chicken bread”) is round in shape and filled with cotton meat originally made from chicken (hence the name), mayonnaise, carrot and green papaya pickle. Bánh mì gà is very cheap (about 8000VND) and simple, yet super tasty and addictive. Who can resist the sweet and salty taste of cotton meat, sourness of carrot and papaya pickle, spiciness of chilli sauce, and fatness of mayonnaise… all combined in a crispy hot bread roll? I know I can’t. 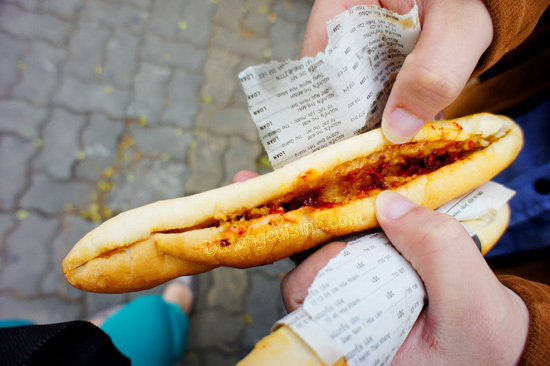 Banh mi ga is very popular in Danang. 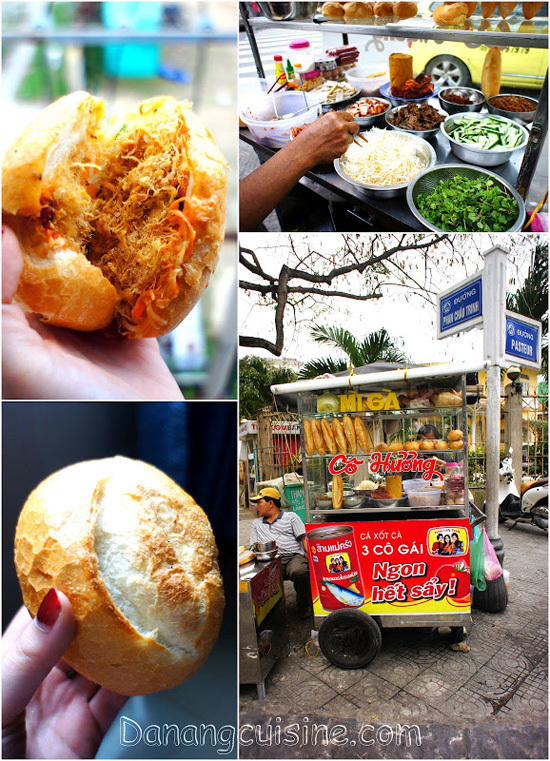 You can easily spot banh mi ga stands along Phan Chau Trinh St, at the area from Trung Vuong theater to Pasteur St. I often buy them at the intersection of Phan Chau Trinh and Pasteur, right next to the street name sign. 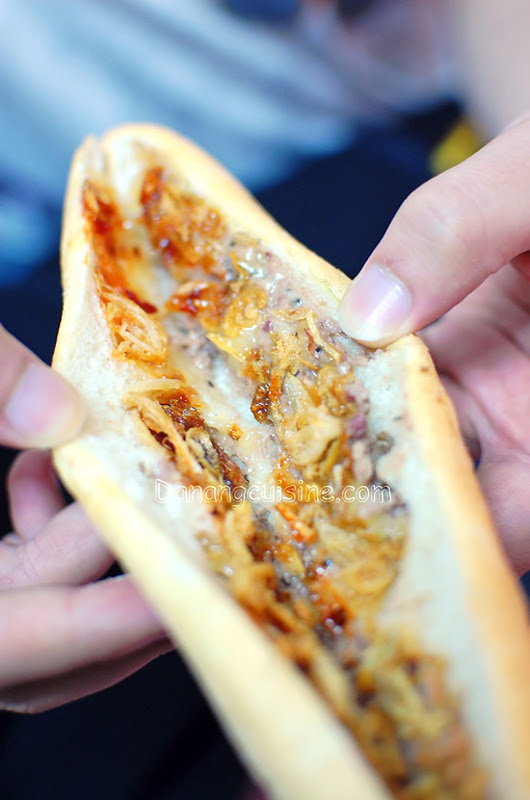 Being one of the cheapest types of banh mi (6000VND), banh mi que (literally banh mi stick) looks like a … stick, filled with only pate, mayonnaise, fried shallots and chilli sauce. But my god is it good. How can something that cheap and simple be so delicious… still remains an unsolved mystery of mankind. For some reason banh mi que and banh mi ga are always sold at the same stand. This banh mi is quite unique as it has no vegetable and the fillings are so simple to the point of being boring: Only Chả, dried chili flakes and a bit of sauce. 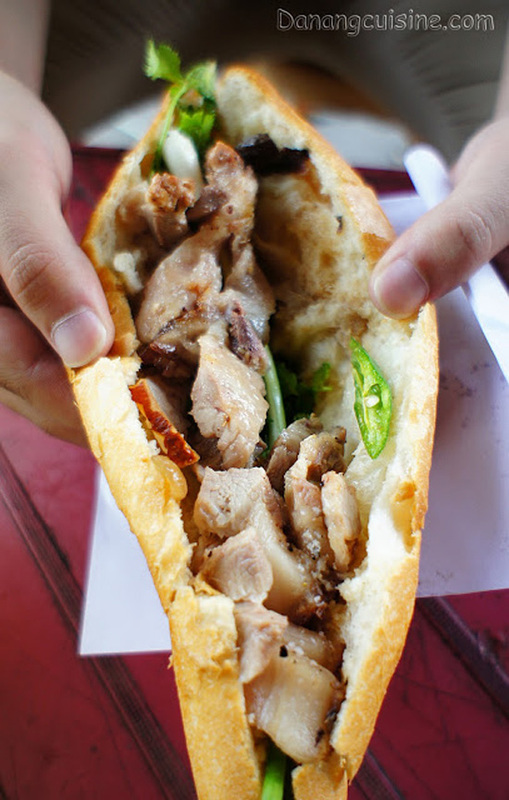 To be frank, curious as I was about this banh mi as it is one of the oldest and most popular banh mi stalls in Danang (they have been in business for nearly 40 years!, and now have 2 shops in Danang), I was disappointed when I bought one. The thing just had a lot of chả and chili flakes if you want it spicy or only the former if you don’t have a thing for mouth-tingling food. However, to my surprise, it tasted amazing and the day after I came back to buy some more. As you can imagine, the selling point of this banh mi all comes down to its in-house made cha which tasted nothing like the ones I normally have. Mr. Ti has spent a lifetime perfecting his cha and banh mi, repeating the same process every day for 40 years. He really reminds me of the legendary sushi master Jiro Ono and the simple fact “practice makes perfect”. Try their special banh mi (20,000VND) and you’ll understand why “Bánh mì ông Tí” has been in this competitive banh mi business for so long. If this was a competition, banh mi bot loc would certainly win the “most regional banh mi” prize. Even the name screams out CENTRAL. You probably know that bột lọc is generally made using 2 methods: one steamed after wrapped up in banana leaves (bột lọc lá chuối), and one directly boiled in water (bột lọc trần). The latter is used for banh mi bot loc, along with some herbs and light sweet fish sauce. For foreigners bột lọc may be a little chewy, but for the locals including myself bánh mì bột lọc is the absolute favourite. They say save the best for last, so here it is: Danang’s banh-mi-ception, aka banh mi inside banh mi. Beat that! The filling is made from banh mi itself, probably soaked and mixed with some spices. As bánh mì bơ literally means banh mi butter, there’s a thin coat of butter on both the inside and outside surface. 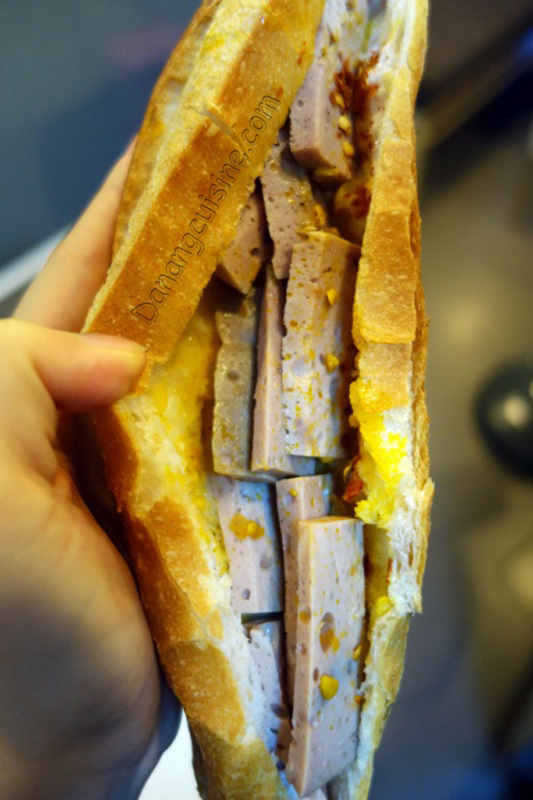 Don’t underestimate this 3000VND stick sandwich, it may be stronger than the strongest heroin. I dare you to find something edible with 15c, let alone something this magical. Apparently it would take a millennium to make a fortune selling this version of banh mi. Thus it is getting much harder and harder to find one, especially when most of them are hauled around town on mobile vendors. Catching a snitch is obviously no match. So you can imagine the thrill when I saw the grandpa below, right in the city center. In the summer there’s a high likelihood of finding banh mi bo along the beach, especially for early swimmers.